Rising temperatures, scanty rainfall and resultant depleting water resources present a scary scenario, so far as bridging the gap between demand and supply of potable water is concerned. The fast rate of water pollution is adding to the scare, be it the rivers or the groundwater. An index of what is really going wrong was presented by a recent study focused on the state of rivers in the country. The number of polluted rivers in the country has risen from earlier 121 to an alarming 275, with unchecked flow of sewage being one of the main reasons of pollution. That makes it imperative for the Centre and the state governments to plan and make the users realise the alarming state of affairs on aqua front and harp on judicious use of water. No effort for environment protection would be complete without focusing on rivers and other means of water supply. After all, potable water is key to success in conserving all other areas. This is not to suggest that the governments are witnessing mutely the vandalism of the rivers and fast depletion of ground water levels. But an alarming situation requires emergency measures on war-footing to prevent a catastrophe taking place in near future. The efforts and plans should be of magnitude greater than the challenge since water is a life sustaining essential commodity. The most ancient source of water, even before the human race came into being, was the rivers. The river systems have sustained civilisations after civilisations since time immemorial. But these systems are facing grave impediments and are under grave threat at present than ever before. The fact of the matter is that the journey of these rivers flowing since ages is being somewhere stopped. Intense pressure of growing population, industrialisation and mind-boggling planned and unplanned development is seriously showing in terms of both quality and quantity of water the rivers provide. Another serious fall-out of pressure on the river basin systems is the over-use of groundwater resource. The demand and supply gap has been widening day by day. As a result both the sources are currently in danger. The solution lies in protecting the rivers and harnessing the available water resource optimally. No socio-economic development or even political stability will ever be possible without ensuring uninterrupted supply of quality potable water. The government too realises that all developments including raising the health index of the people depend on availability of quality water. That is why the renewed approach to give fillip to protecting rivers and rejuvenating groundwater level has been adopted. A positive of the government’s plans on this front has been to raise the profile of the rivers that adds a psychological edge in attempts at river protection. A testimony to government’s seriousness on river protection is the reorientation of the Ministry of Water Resources which in the past did not have any clarity on scope of work and meagre financial allocations. The Ministry’s work charter has now been broadened to include River Development and Ganga Rejuvenation plans. A related positive development has been raising the stature of drinking water and sanitation functions from a mere department under the Ministry of Rural Development to a full-fledged Ministry. These are being considered as indications of a more serious approach which the Centre intends to adopt on the river protection and other water related issues. It would entail introducing new technologies in view of many water projects including dams and reservoirs being cited as the causes for ecological disasters with a negative impact on peoples’ life. Being the longest river (2525 Km) in the country and second largest in the world, naturally, Ganga has remained to be the central theme of the successive governments’ river conceptualisation plan in terms of protection and cleansing and more so that of the present government. Apart from the length and the quantum of water, Ganga enjoys special sanctity. Moreover, the fact that Ganga has become the fifth most polluted river of the world, provides a trigger to act fast in restoring its status not only as a river that fulfils needs but also a symbol of faith and devotion for millions. Many stretches of the river are polluted and water is unfit for drinking as varied pollutants are present in much higher quantity than the prescribed limits. 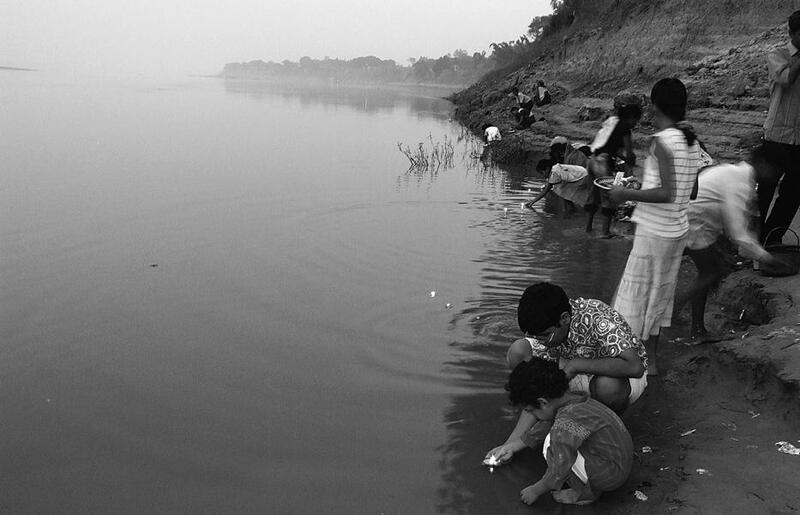 In recent times, the clamour for a cleaner Ganga has gained momentum. Vigorous efforts by the present government are in line with this thrust being laid by various quarters. The small steps can help reduce the pollution and restore river’s glory. But on a bigger scale the canvas has to be widened that should involve plans at economic revitalisation of Ganga with the participation of neighbouring countries such as Nepal and Bangladesh. The Ministry of Water Resources had drawn a multi-phased plan for Ganga cleaning under the ageis of its “Namami Gange” programme. In the first phase 200 villages along the river side will be covered. A key area of focus would be to divert open drains falling into the river and make alternate arrangements for sewage treatment. Every village household would be encouraged to have toilets within. An estimated Rs one crore would be spent on every village. A special task force has also been created. First battalion of Ganga Task Force was recently deployed at Garhmukteshwar while three more such formations would be on course at Kanpur, Varanasi and Allahabad. The force comprises of ex-servicemen who will be posted along the river for monitoring pollution. "The Ganga Task Force will be deployed on the banks of the river and will ensure industry and civilians do not pollute the river. However, keeping Ganga clean is not the responsibility of our jawans only, but of every Indian living near the river," water resources Minister Ms Uma Bharati has said. The Namami Gange scheme has a budgetary allocation of over Rs 6,300 crore. Out of this Rs 2037 crore have been earmarked for rejuvenating the river, while another Rs 4200 crore will be spent on developing a navigation corridor in the next six years. Also there is a Rs 100 crore project dedicated to ghat development and waterfront beautification. The government also announced a 'NRI Ganga fund' to raise funds to be spent on 'special projects'. To further strengthen its charter related to green environment, "HARIYALI” project connected with plantation is also being started along the river Ganga in all five states namely Uttrakhand, Uttar Pradesh, Bihar, Jharkhand and West Bengal through which it flows. The plantation will be monitored every six months and a video recording will be sent to the headquarters every time for verification. The first attempts at cleaning Ganga were started in 1985. As part of his river cleaning plans the Ganga Action Plan was launched with fanfare. At that point in time the project was launched with sole motive of improving the quality level of water of Ganga and its tributaries to bathing levels. Subsequently, the rivers cleaning plan was not only continued by successive Governments but they even expanded its scope and area of coverage. This could be gauged from the fact that whopping Rs 4,032 crore was spent to clean 41 rivers that covered 190 towns spread over 20 states. The moot point is whether these efforts and spending huge amounts delivered any tangible results. The answer is for everyone to see from the current state of affairs of the rivers particularly Ganga and Yamuna. On the lines of Ganga Action Plan I and II, such plans were also introduced covering various other rivers including Yamuna. The condition of both Ganga and Yamuna is for anyone to see and evaluate. The Yamuna Action Plan had started in 1993-94 with financial and technical assistance from Japan. The phases of the plan had incurred a cost of over Rs 1500 crore by 2011. The effort is still on with no serious results in sight. In the nearly three decades old efforts of the successive governments at river restoration the success rate has been negligible. It throws a big challenge to the present dispensation as well to ensure that its plans succeed. The government has begun efforts in the right earnest. Creating the right kind of infrastructure has been the prerequisite. A step in this direction has also been the setting up of the National Bureau of Water Use Efficiency and modernization\expansion of flood forecasting network of the Central Water Commission (CWC). In addition, thrust is being laid on speedy completion of the contentious Polavaram project in Andhra Pradesh and re-launching the Yamuna rejuvenation plan. These, in fact, are the priority areas for the Ministry of Water Resources and considerable headway has been made on these fronts. There do exist certain dichotomous situations so far as Ganga and Yamuna Action Plans are concerned vis-a-vis the past efforts. For example, it has not been clarified as to how the new Yamuna Rejuvenation Plan would be different from the one already in operation on which an amount of Rs 1514 crore has already been spent. Furthermore, new projects worth Rs 3230 are being implemented in Delhi-Haryana stretch of the river. A great challenge is ensuring sensible use of available water resources by different sets of users. Fully conscious of this challenge the Ministry of Water Resources is setting up an autonomous body named National Bureau of Water Use Efficiency to control and regulate efficient use of water by adopting modern and traditional practices of water use which will work on the pattern of Bureau of Energy Efficiency. The project has been in the pipeline for the past four years and it has been taken up with renewed vigour. This autonomous body will have members from different central ministries, water experts and representatives from industries and civil societies. It will also be in charge of labelling and certification for public utilities, local bodies and industries that manufacture household water fixtures and appliances. It is expected that due to representative character of this body the problem of lack of coordination among various ministries and departments related to water as a subject would be addressed to a great deal. The multiplicity of authorities dealing with water has been a big setback in the past to evolve water as a concept. River protection is a phenomenon which has to be all inclusive. Filling infrastructural gaps would also help in properly conceptualising the river protection planning. This entails not only concentrating on the mainstream network of the rivers but also tributaries, rivulets and torrents. One of the neglected aspects of river development in India has been navigation. The present government has taken a serious note of this missing link and the Ministry of Surface Transport has drawn ambitious plans to revive old waterways and develop new ones to provide cheaper means of transportation through this mode. This, of course, is directly related to health of the rivers as navigation would require a particular level of water flow. A bigger challenge for the government is to provide quality potable water to the vast rural population. The task is uphill as any effort has to address the needs of more than 700 million people living in about 1.42 million habitations spread over 15 diverse ecological regions. A multitude of problems related to socio-economic set up, education, poverty and rituals make water supply to rural areas a more complex issue. The effect of the poor quality water supply in rural India has a telling effect on the health of predominantly poor rural populace. Surveys suggest that annually about 37.7 million people suffer from water borne diseases. About 1.5 million children die due to diarrhoea alone. On economic front 73 million working days are lost every year only due to water borne diseases causing enormous revenue loss. The Centrally sponsored National Rural Drinking Water Programme aims at providing adequate and safe drinking water to people in rural areas in a phased manner. The scheme envisages creating infrastructure and capabilities to ensure successful operation of drinking water supply schemes in rural areas. As per this plan it is expected that 50 per cent of the rural households would be provided with piped water supply by 2017. Importantly, care is being taken to ensure that all services meet set standards in terms of quality of water and timing of supply every day. By the end of 2022 the NRDWP intends covering 90 per cent of the population. Maintaining water quality and other environmental parameters can only be achieved through the participation of all stakeholders. The key area would be maintaining hygiene near water sources. That requires improving the ways in which water is collected and stored to prevent contamination of water. The government plans envisages involving panchayats and other civic bodies to launch awareness campaigns and ensure greater participation of people. Accordingly the policies have undergone key changes.